Pinnacle Custom Signs is a proud member of the Signworld family. Signworld provides entrepreneurs a business opportunity but it is not a franchise. Being a member of the Signworld family gives you the freedom to build your business outside of rules and without franchise fees. When our company signed a contract with Signworld, we got world class training in both the business and technical aspects of becoming experts in the sign industry. Some of our Signworld colleagues specialize in a single signage service such as vehicle wraps but all our colleagues have gained a tremendous support network from our affiliations. Pinnacle has chosen and has the freedom to offer numerous services that many of our colleagues choose to subcontract to us for completion because they specialize in a certain field. Signworld provides a network of preferred suppliers/vendors, in which they negotiate pricing for these often-small businesses as though they were part of a franchise. Then we can pass those savings along to our clients. The most valuable aspect of being a part of the Signworld organization is the network of 300+ other sign businesses across the country, that we often think of as being a big family of sign companies. Most people would see these other shops as competitors, but we do help one another out. Owners Don & Theresa Conklin have worked with several businesses locally and across the United States that have opened over the years to give them on-job/on-site training. 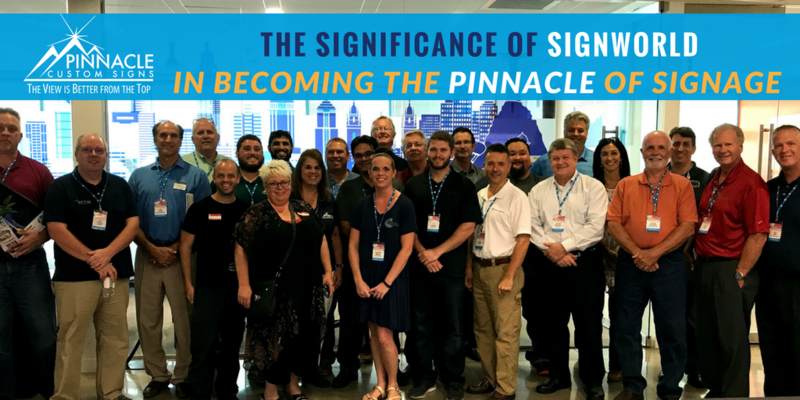 Investing in these new sign companies and showing them how Pinnacle operates strengthens our network across the country. Our strong network allows us to coordinate and ensure that we can provide the same type of stellar service when we install signs 20 miles or 2000 miles away from our home office. 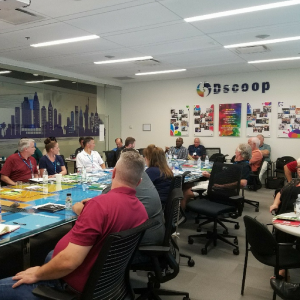 In addition to our national network, we are also part of a group of eight of us that meet twice a year to review our operations and try to improve our businesses. This also helps us to build on these friendships, in addition to improving our business by taking the best from each business to apply to our own. 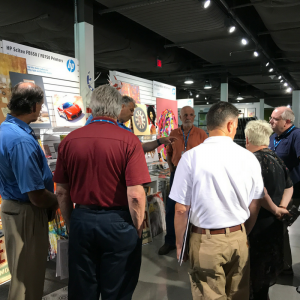 Recently, we met some of our Signworld colleagues in Atlanta at an event sponsored by Advantage Sign & Graphic Solutions, one of the preferred partners that provides media, printers, ink and other sign supplies for our business. Also, invited were several other vendors who are part of the Signworld network of suppliers to give us a presentation on their offerings. Avery Dennison who provides print media, Graphtec who provides plotters/cutters, GFP who provides laminators, Onyx Software and Hewlett Packard joined us for the event. 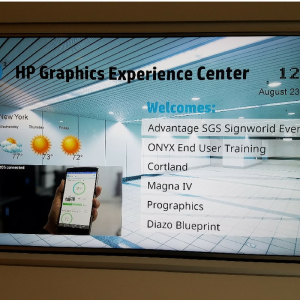 All Atlanta Signworld operations were invited to attend, and approximately 10 operations joined the meeting held at the HP Experience Center, where we also got a tour showing all their different types and sizes of printers – from the simple roll to roll Latex printers to their UV Flatbed printers. The meeting was an opportunity to network with our fellow Signworld owners, learn about new technology and also have fun as with others in the industry at Top Golf after the meeting. Having a sign company at your disposal that has a network of production, design, experience, and installation across the United States provides a strategic advantage to our clients. The reality is that there is no project that comes through our office that we can not complete because if we haven’t done it before – there is someone in our network who has and can tell us how to do it better. Our network is what allows us to guarantee that we can duplicate your brand standards and have it installed in the same way in locations from Atlanta to Chicago to San Diego, because we can collaborate across the United States. When deciding on a sign company, ask about their areas of expertise and their network of suppliers and vendors. Our partners allow us to offer low cost and higher quality for many of our clients. The benefits of being a member of this organization are directly reflected in our relationship with our clients. 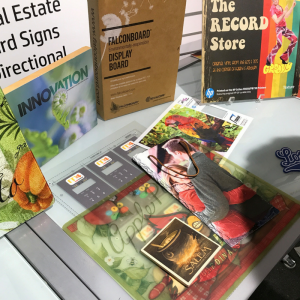 It gives us a fraternity of individuals to show off your final project and help us to become a better sign provider for each client we encounter. So if you have a project where you need the best team of experts to complete your look, then please contact us today for us to discuss how we can help your business.